Guitar notes are at the heart of everything a guitarist does. They are the building blocks we use to play all chords, riffs & solos. So mark this lesson as a ‘must-read’! This is the way most guitars are tuned. There are other ways to a tune a guitar that change the guitar notes, but it’s best to avoid alternate tunings while you’re a beginner. There are six strings on a guitar. Each string has a name AND a number. These notes are exactly the same on acoustic, electric, classical and semi-acoustic guitars. What’s the difference between guitar notes and guitar chords? Notes are the smallest unit of musical language. We group notes together to form chords. To form a chord, we need to group some notes together. What do guitar notes sounds like? Can you hear and see how the notes follow on from each other? These are single guitar notes. What go guitar chords sound like? A chord is made when we stack guitar notes together and play them all at the same time. Click play to listen to this ‘A’ chord. The chord has a larger and fuller sound because we hear several guitar notes played at the same time. 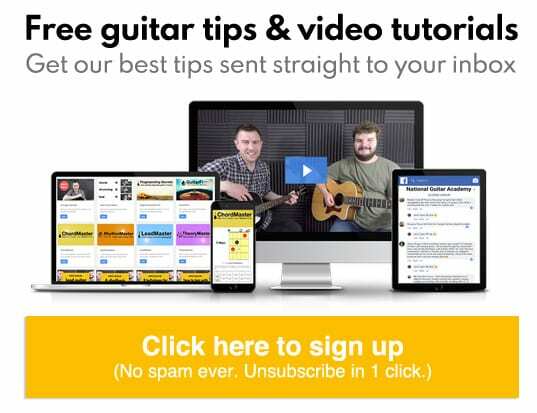 You can learn easy versions of every guitar chord in our Easy Chords section. Don’t make this common beginner mistake! One of the worst mistakes you can make as a beginner guitarist is to try and learn all the guitar notes on the fretboard. In my experience (20,000+ hours teaching guitar beginners) it’s totally overwhelming for guitar learners who take this approach. 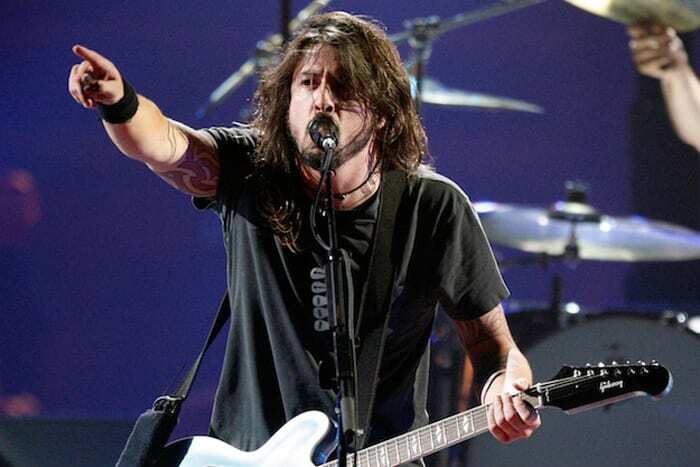 All your energy as a new guitarist should be focussed on chords. Objectively, this is a more successful approach. I think this is because it’s easier and more fun to learn some static chord shapes and immediately begin making music. So learn a few simple chords and get strumming; You can master your fretboard’s DNA at a later point. Eventually everyone ‘graduates’ to focussing more on guitar notes, scales and theory, but you should NOT start there. 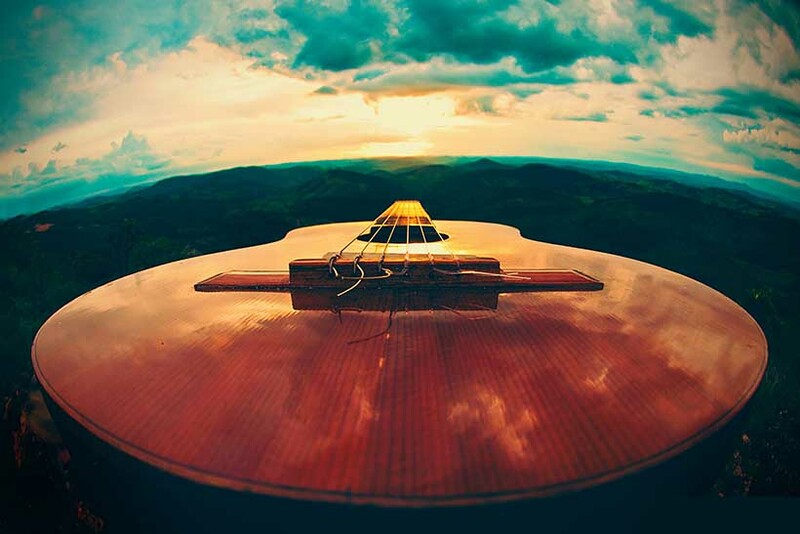 Focus exclusively on chords and strumming during the first 3-5 months of your guitar journey. We’re going to move on now and explore the fretboard in greater depth. This is NOT essential knowledge for an absolute guitar beginner, but it will deepen your understanding of the instrument if you want to learn more. Read on only if you want to learn more about the musical alphabet and how guitar notes lay across the fretboard. There’s useful stuff here, but I don’t want to overload you if you’re new to the instrument. I’ve always found it a bit odd how many musicians don’t know their musical alphabet. After all, the normal alphabet has 26 letters and the musical alphabet only has 12 notes. The normal alphabet goes from A to Z. The musical alphabet goes from A to G.
However, we have to remember our sharps and flats which appear between most (though not all) of the letters. A, A#, B, C, C#, D, D#, E, F, F#, G, G#, A. The # symbol means ‘sharp’. So you pronounce “A#” as “A sharp”. Sharps and flats are the same thing, just looked at from a different angle. A, Bb, B, C, Db, D, Eb, E, F, Gb, G, Ab, A. We use the “b” sign to denote “flat”. So A sharp (A#) can also be called “B flat” (written as Bb). A# and Bb are the same note. If it were 9.30 in the morning you could say it was “half past nine” or you could say it was “30 minutes to ten”. Both descriptions would be accurate and both describe the same thing. Once again: A# and Bb are the same note. The same goes for the other sharps. C# (AKA “C sharp”) is the same note as Db (AKA “D flat”). D# is the same note as Eb. F# is the same note as Gb. G# is the same note as Ab. A, Bb, B, C, C#, D, Eb, E, F, F#, G, G#, A. Do all guitar notes have a sharp or flat? You may notice that not all the letters have a sharp between them. We go straight from B to C. There is no ‘B#’ or ‘Cb’ in-between. We go straight from E to F. There is no ‘E#’ or ‘Fb’ in-between. In music, there is no B#/Cb or E#/Fb. They don’t exist. If we pluck a string without fretting any notes we say that we’re playing an “open string”. We say we’re travelling ‘up’ because the pitch of the notes goes higher. Start by plucking the open 5th string and you will hear an A note. Then press on the first fret on the 5th string and pluck. You will hear an A# note. Keep going. Congratulations, you just moved through a full octave! If you’re not at A when you reach the 12th fret, chances are you’ve missed out a sharp or added one where there shouldn’t be one. Go back and check. Once you get used to counting up the string using sharps, why not try counting back down it, this time using flats? If we want to go ‘down’ the fret board we go the opposite way, towards the neck and tuning keys. A, Ab, G, Gb, F, E, Eb, D, Db, C, B, Bb, A. This is harder to do, as most people don’t know their alphabet going in reverse! Take your time and get it right. NINJA TIP: Saying the notes aloud as you play them helps embed the guitar notes in your mind. This is an example of neuro-linguistic programming and you can use this to learn faster. 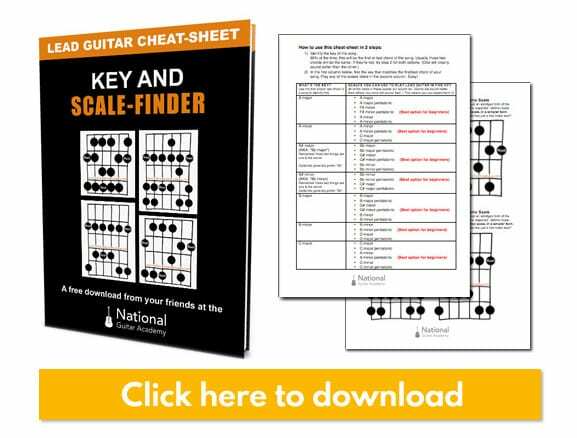 It can be disorientating for guitarists to understand which scales work with which keys. With this in mind, we created a cheat-sheet; a key and scale-finder that you can use again and again. Click here to download your copy. If you look on the neck of most guitars you will see fret markers (little white dots). These show you which frets are which. The dots are usually on the 3rd, 5th, 7th, 9th and 12th frets. Don’t worry too much about what this means (octaves are just how we split all the notes into manageable portions). Can you hear how the two guitar notes are harmonious? They are both A notes, but 2 octaves apart. The notes we’ve covered so far are called natural notes, because they have no sharps or flats. Let’s have a look at finding these natural notes on the fret board. There are couple of rules we can use here to help us find these notes. Between every natural note, there is a two fret gap. This is what’s known as a whole step. However some notes don’t follow the two fret rule! The gap between these notes is just one fret. As we learnt earlier, this is between B and C, and E and F.
This is known as a half step. Now let’s look at how we can find these notes on each string. We know that the open note is tuned to E, which is a natural note. Let’s try and find the natural notes on the E string. Play along with this exercise. So if we take a look back at our rules, we can easily find the 2 fret gaps in between the notes, as well as the one fret gaps. Between E and F, there is only one fret. We covered this above. We know E is the note of our open 6th string, therefore F must be found on the very next fret. The first fret. F and G have a 2 fret gap between them, so if we go up two frets from the 1st fret we land at fret 3. So fret 3 on our E string is a G note. G to A has a 2 fret gap too, if we go up two frets from the 3rd fret where our G was, we end up at the 5th Fret. So fret 5 on the E string is a A note. 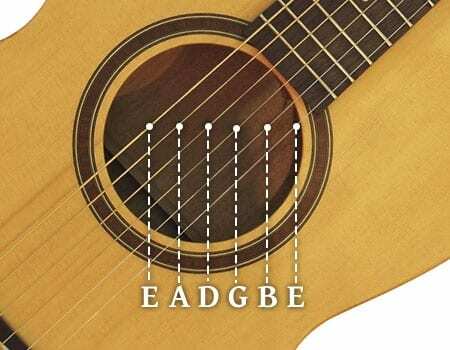 A to B also has a two fret gap, so if we go up two frets we end up at fret number 7, therefore the 7th fret on the E string is a B note. I hope you can see that it’s pretty easy stuff, but watch out for the B to C. This is that sneaky half step, where we have to go up only 1 fret, instead of 2. Ready to keep going? Let’s walk together all the way up to the top. So if B to C has a 1 fret gap, we end up at the 8th fret on the E string. Therefore fret number 8 is a C note. C to D has a 2 fret gap, therefore if we go up two frets from 8th fret, we end up at the 10th fret. So the 10th fret is the note D.
D-E has a 2 fret gap, therefore if we go up two frets from the 10th fret, we end up at fret number 12. So the 12th fret on the E string is an E.
So we’ve now done the full cycle and ended up at the E note in the higher octave. You should be able to hear that the open E string, and the note at the 12th fret sound the same. The note on the 12th fret is higher in pitch, but can you hear that they’re the same? Try it now. Find all the natural notes on the low E string. Find all the natural notes on the A string. Find all the natural notes on the D string. Find all the natural notes on the G string. Find all the natural notes on the B string. Find all the natural notes on the high E string. Once you’ve done this, you may realise that some notes overlap from one string to the next. Well done! You are discovering the fretboard. Unlike the piano, where notes are played in a continuous line, the guitar notes overlap from string to string. We covered this earlier, but I’d like to look at it again, from a slightly different perspective that helps it ‘click’ in some people’s minds. This is very confusing for most people, so it probably is for you too. Don’t worry, it’s normal! Now you know about natural notes, you will see this from a different angle. Sharps and flats are the notes that are in-between the natural notes. Sharps and flats live in the ‘spaces’ between these notes. To create a ‘sharp’ we have to sharpen a natural note. We do this by increasing the pitch of the note by one fret. This is a half step. So for example, if we have the natural note of “A” and we sharpen it, it will become “A sharp”. Once again: We write ‘sharp’ by using a hashtag symbol. “A sharp” is written as “A#”. Here are the A and A# notes on the fret board. Can you see that the A# notes are always one fret higher than the A notes? Here’s what it would look like on musical notation. See the ‘hashtag’ symbol? When we look at sharps on a musical page, it never says the word ‘sharp’. It will have a ‘#’ instead. A flat is like the ‘opposite’ of a sharp. When we flatten a note we go the opposite way, so we decrease the note by one fret. This is a half step. So if we have the natural note of A and want to flatten it, we go down a half step/one fret. This becomes “A flat” which we write as “Ab”. The lowercase B symbol is how we write ‘flat’. Here’s a picture of the fret board showing you all the A’s and the Ab’s. Can you see the Ab notes are always 1 fret lower than the A notes? Here’s a picture of what it would look like in musical notation. When we see flats on a musical page, it will never say the word ‘flat’. It will always have a lowercase “b” after it. A quick sharps and flats test! When we sharpen or flatten notes, there are a few rules to remember. All notes can be sharpened except B and E.
Because sharps and flats are essentially the same thing there is lots of confusion caused by the duplicate terminology. Check out my article “What’s The Difference Between Sharps and Flats? Which should I use?” to make this concept a lot easier. Let’s try and make something really clear. Let’s take two notes: A and B. We can sharpen the A. Which would give us A#. We can flatten the B. Which would give us Bb. These two notes are EXACTLY the same, they just have different names. As well as notes, the chords A# and Bb are exactly the same. Now we understand about sharps and flats, we can use this information to help us find these notes on the fret board. Let’s take the low E string. We already know where all the natural notes are. 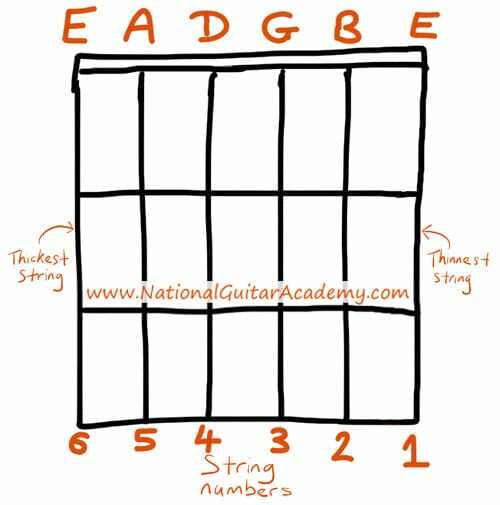 We already know that there are no sharps or flats between E and F.
So the open string to fret 1 is easy! Nothing to worry about there. The next note after E is F.
We know F and G are frets 1 and 3. So what we need to find out is what note fret number 2 is. We know we can sharpen F, which would make fret 2 F#. We could flatten G, which would make it Gb. Therefore we can say the guitar note on fret 2 is either F#/Gb, because they are exactly the same note. We already know G to A is frets 3 to 5. So the fret we are looking for is fret number 4. To do this we can sharpen G, which would make fret 4 G#. We need to flatten A, which would make fret 4 Ab. Therefore fret 3 is either G# or Ab. They are the same note. We already know A to B is frets 5 to 7. So the fret we are looking for is fret number 6. To do this we could sharpen the A, which would make fret 6 A#. We could flatten the B, which would make fret 6 Bb. Therefore fret 6 is A# or Bb. They are the same note. We know that B to C is a half step and that we can’t sharpen or flatten either note. So that one is easy! The next note after B is always C.
We know that C to D is frets 8 and 10. So the fret we’re looking for is fret 9. Here we could sharpen C, which would make fret 9 C#. We could flatten D, which would make fret 9. Db. Therefore fret 9 is C# or Db. They are the same note. We know that D to E is frets 10 and 12. The fret we’re looking for is fret 11. We could sharpen D to make fret 11 D#. We can flatten E to make fret 11 Eb. Therefore fret 11 is either D# or Eb. They are the same note. Here are some diagrams of the natural and sharpened notes. Here’s the same diagram, but instead of sharpened notes we now have flattened notes! Hopefully you can see that the natural notes are the same and the sharpened and flattened notes line up in exactly the same place. Find all the sharp and flat notes on the E string. Find all the sharp and flat notes on the A string. Find all the sharp and flat notes on the D string. Find all the sharp and flat notes on the G string. Find all the sharp and flat notes on the B string. Find all the sharp and flat notes on the high E string. Let’s look at a G chord. If we have a look at our C Chord, the first note which we play in a C chord is a C note. The first note in a chord can help us know what the chord is (& vice versa). Understanding the flow of guitar notes on the fretboard can help us develop our chord knowledge too. 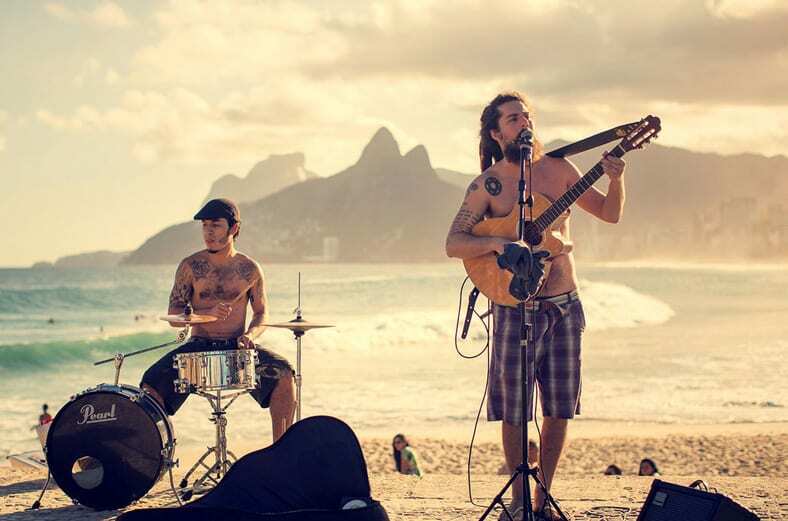 Guitar chords and guitar notes blend together through rhythm and lead guitar. Knowledge of one helps you gain knowledge of the other. It’s a virtuous circle. Click below to download this lesson’s worksheet. Try the quiz and keep the worksheet for future reference. Click here to download the lesson worksheet. I hope you found this lesson useful and that you now feel you have a much better understanding of guitar notes.